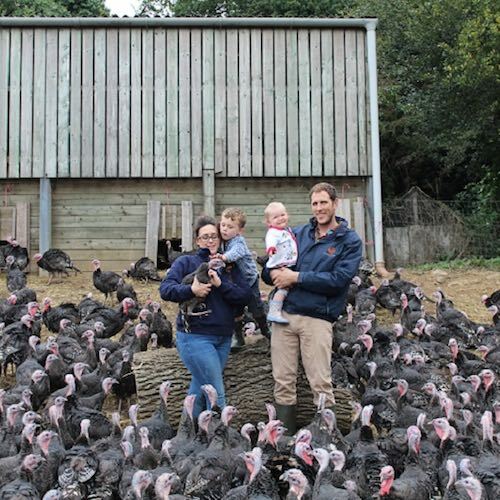 Treway Farm Cornish Turkeys is truly a family business affair, run by husband and wife team Will and Kate Martin, son Charlie, daughter Flora and Labrador Reuben. Treway Farm is located just outside the village of Grampound in mid Cornwall. With its 300 acres of rolling hills and deep valleys, it makes the perfect place to rear our free range bronze Cornish turkeys, commercial Limousin beef herd and Pedigree Shorthorn cattle. We took ownership of Treway in 2007 and have built up a herd of 200 Limousin cross cattle which are all enrolled in the well known ‘Red Tractor’ scheme. Our beef can be found in butchers across the county and beyond. We started producing our bronze turkeys back in 2010 for a few friends and family and have slowly built up to the business we are today. Treway Farm Turkeys is the first and only producer in Cornwall to be accredited with the ‘Golden Turkey Standard’ an assurance scheme which guarantees the highest welfare standards for the birds and stipulates the birds must be reared using age old traditional methods and fed a natural diet which gives them exemplary flavour.